Monte Huebsch "The Google Guru!" 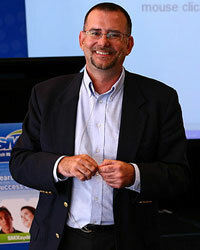 Monte is the CEO of AussieWeb Local Search and AussieWeb Conversion - a Google Premier SME Partner. Monte, his team and company are AdWords Qualified Individuals and an AdWords Qualified Company. More importantly, AussieWeb Conversion was invited by Google to become the first Queensland Google Premier SME Partner and the longest serving in Australia. This process “straddles” the narrow targeting of AdWords and the topic depth of SEO. This is what successful companies are doing today. No “junior” content creators, no outsources authors, just your intellectual property on steriods from the comfort of your office over the telephone.